Trusted Reviews has tested the Sony Handycam HDR-TG7VE camcorder. This camcorder from Sony has a very small design, contains 16GB of internal memory and is able to record 1080i HD video. Trusted Reviews ends up giving the Sony Handycam HDR-TG7VE an overall score of 8 out 10 points. The camcorder scores highest on image quality and features while scoring a little lower on value. 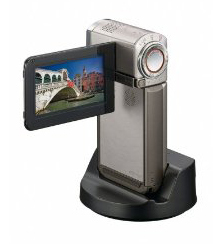 The Sony Handycam is able to record videos of very high quality and it contains a lot of handy features. The only downside is the high price tag so if you are on a tight budget you might want to look at other pocketable camcorders. Read the full review of the Sony Handycam HDR-TG7VE camcorder here.